For as long as I could remember, I grew up listening to the stories of a place called Thailand. I’ve always known it as the place where my parents met and fell in love, started a family, and most importantly, where my parents and grandparents sought refuge. 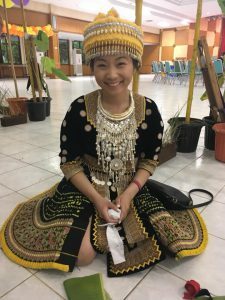 As a Hmong daughter born and raised in the United States, I hardly saw Thailand as my home. Growing up in White Bear Lake, Minnesota, a predominantly Caucasian suburb, I was always reminded that I was different. That I was Hmong. I was always one of the two or three students who wasn’t Caucasian, and sometimes, the only Asian. I grew to become very uncomfortable with that because I never liked to stand out, therefore, always aimed to disguise myself by adjusting to the American culture. Although I’ve learned to embrace my native heritage throughout my college years, my past of allowing society to validate my identity continues to haunt me into believing that the States is my only home. Throughout my time in Thailand, I’ve experienced a roller coaster of emotions. 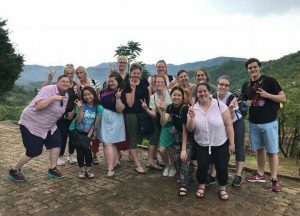 Our visit to the Pha Nok Kok Hmong village was a wonderful experience but it initially overwhelmed me considering my unpreparedness to translate for the entire class. This is due to a personal lack in practicing my native tongue to where I wasn’t completely confident regardless of Hmong being one of the most spoken languages at home. In addition, we learned a lot about the Hmong culture, such as Shamanism being the most common religion. Because of my affiliation with Christianity, I felt that I was unable to answer a lot of the questions that I was asked. This also resulted in my assumption that I didn’t have much of a part in explaining the ways of my culture because of the different practices that my family partakes in. Eventually after one week, which was also the longest I’ve been away from home, my feelings began to consume me and I became very homesick. I felt like I didn’t fit the description of my own people, nonetheless, the Thai culture that my father takes pride in. After talking to Jory about my situation, I learned that homesickness isn’t necessarily something that a person has to overcome but that it could just be something to accept. Through this, I was able to accept the fact that I thought about home too often because I was convinced that I wasn’t “Hmong enough” to properly interact with the Hmong elders and families in Thailand. 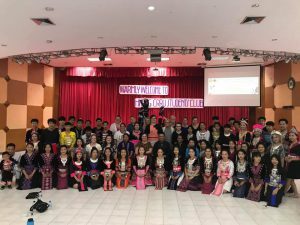 Although the next day, in my opinion, felt like it occurred just in time because it was the day we visited the Hmong Club, CRUU, at the university in Chiang Rai. The amount of interaction that took place during this visit was overwhelmingly comforting and marked the beginning of a new approach for me. The students and faculty members at the event were very welcoming and did not shy away from initiating conversation. I had many discussions of what life was like in the United States and overall got to know many of the students. Something that stuck out to me was the fact that I wasn’t the only one struggling to communicate in Hmong. To my surprise, the Hmong students also found it challenging to speak in their native language because of the dominant Thai culture. 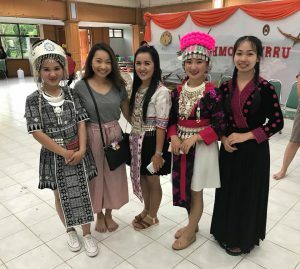 In the United States, it is very easy to assume that the Hmong youth in Thailand are well-immersed in the Hmong culture and language when in reality, they’re no different from us. Through this experience, I learned a great amount about my own culture that I never got the chance to, such as learning how to make the balls for ball tossing, and felt at home through the connections that were made. This was definitely one of my highlights which also motivated me to just live in the moment each day moving forward. With an abundance of activities that our class has had the privilege to take part in during our time in Thailand, no one-day will suffice for the sacrifice that my family, as well as my people, made in order for me to be here today. One of the most meaningful moments I experienced occurred yesterday during our last lunch at the Mekong school in Chiang Khong. A man came up to me and asked if I was Hmong as I responded with a, “Yes.” We then continued to have a discussion about the Hmong population in Chiang Khong which led to his conclusion of the exact words, “Thank you for visiting your homeland.” These words were unforgettable to me because it reminded me just as to why I decided to embark on this journey in the first place. Thailand is filled with immense culture and life, and is home to my people, my family, and therefore, it is my home. I hope to bring back the lessons and experiences with me with the goal to embrace more of my language and culture, so that one day I may return with more eagerness to live and learn.